On November 16, Historic New England members and others enjoyed the opportunity to meet Christine Hadsel, project director of Curtains Without Borders and author of Suspended Worlds: Historic Theater Scenery in Northern New England, winner of Historic New England’s 2016 Book Prize. Suspended Worlds celebrates these historic theater curtains and their role in community activities and entertainment. 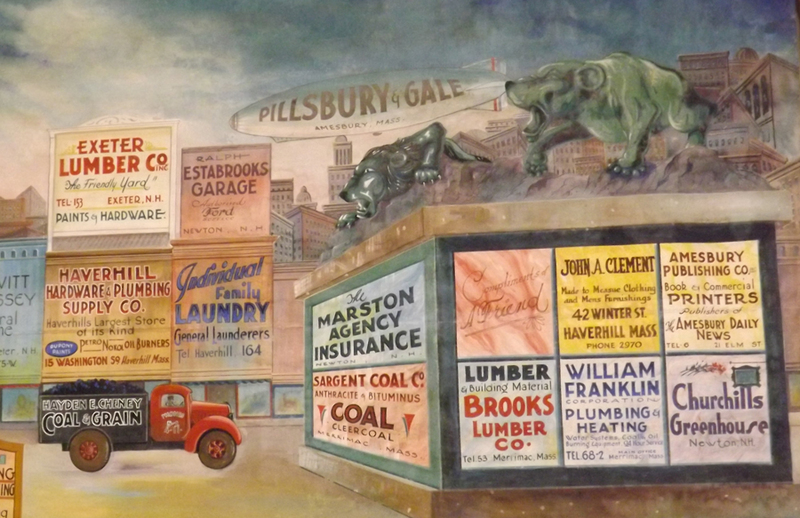 The curtains range from grand drapes depicting faraway lands, country landscapes, and city streets to Grange Hall curtains full of local advertisements (like the one shown here). Christine accepted the Book Prize at the town hall in Newton, New Hampshire, which houses two great examples of these beautiful scenic curtains. Buy your own copy of Suspended Worlds at Historic New England’s online museum shop.